Powerboating with minimal environmental impact — that’s what Greenline is all about. Greenline Hybrid Yachts produces a fleet of boats from 33 to 48 feet that allow you to enjoy fuel-efficient, clean and quiet coastal cruising. 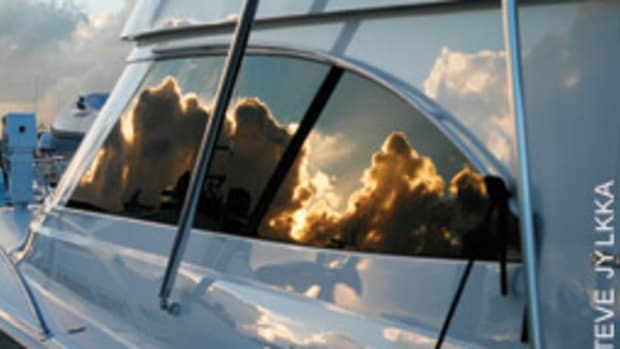 With their diesel/electric hybrid propulsion, solar panels and slippery hull design, these coupe-style cruisers suit environmentally conscious boaters who appreciate not just the destination, but also the journey. Zinchenko acquired Greenline after its previous owner, Seaway Yachts, also based in Slovenia, filed for bankruptcy in March 2015. 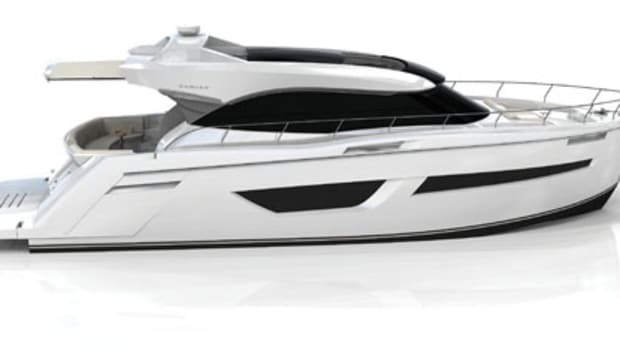 He reintroduced the brand in the United States at the Fort Lauderdale International Boat Show last fall, bringing five boats, including the first new model under his ownership: the Greenline 36 Hybrid. I got a chance to test a 36 in Dania Beach, Florida, with Greenline’s U.S. sales manager, Dennis Rhodes. The 36 — along with the Greenline 33, 40 and 48 — can be ordered with diesel/electric or diesel-only propulsion. The boat available for testing was a diesel-only model. However, I was able to try out the builder’s hybrid technology on a Greenline 40, just a few slips away from our test boat (see “A Winning Combination,” facing page). The 36 test boat was outfitted with the optional single 370-hp Yanmar, which provides a maximum range of 601 nautical miles at 6.5 knots. 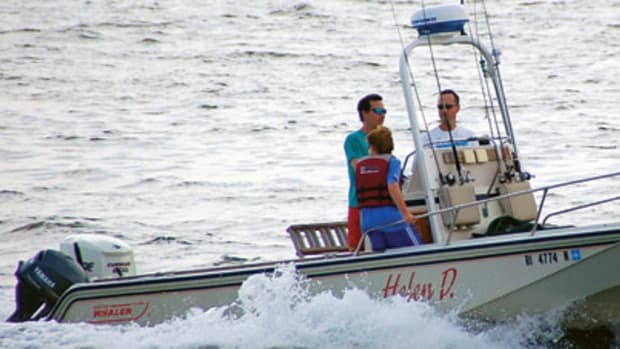 At 17 knots, her range is about 260 nautical miles, with a mileage rating of 1.5 nmpg. The standard 220-hp Volvo Penta diesel is the more economical engine, with an advertised range of 1,000 nautical miles at 7 knots. The hybrid system consists of the Volvo Penta diesel and an inline 15-hp (10-kW) electric motor that pushes the boat to a top speed of 6.5 knots. We took the 36 out of Harbour Towne Marina, which is on the Dania Cut-Off Canal at the Intracoastal Waterway, just south of the Port Everglades Inlet in Florida. The Yanmar was mounted in a compartment under the saloon sole with enough room to access all key maintenance points. The skipper drives from a starboard two-person helm station, with clear sightlines in all directions except through the deckhouse’s starboard aft section, where there is a full-size refrigerator/freezer. The helm’s black dash reduces windshield glare for better visibility. 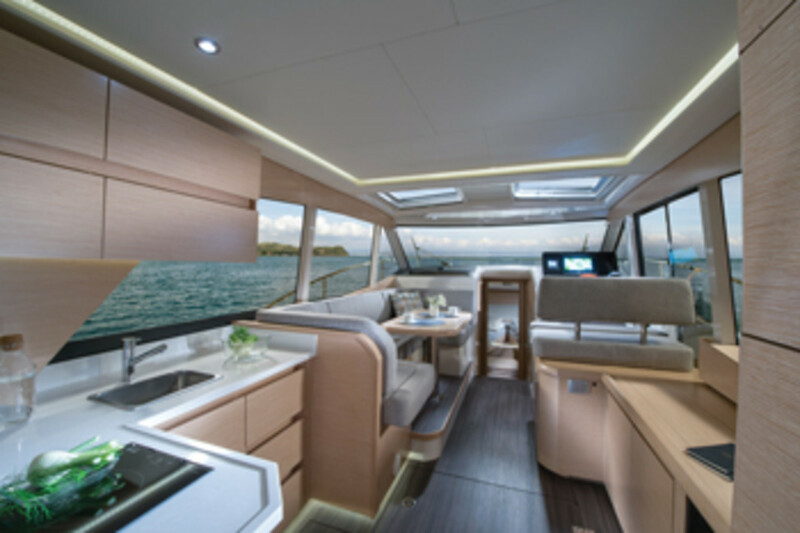 A tinted sliding glass door opens from the helm for quick access to the side deck. The deckhouse is offset to port, so the starboard side deck is about twice as wide as the port side deck and, therefore, the safer passageway to and from the bow. The boat’s electronics panel held a 12-inch Raymarine GPS/chart plotter with an accompanying digital instrument display and a Yanmar engine display. I noticed two helm issues that could easily be fixed: The compass was mounted forward of the electronics panel and not within easy sight of the helmsman’s position, and the VHF radio was too close to the wheel, causing my knuckles to scrape the volume knob when I steered. 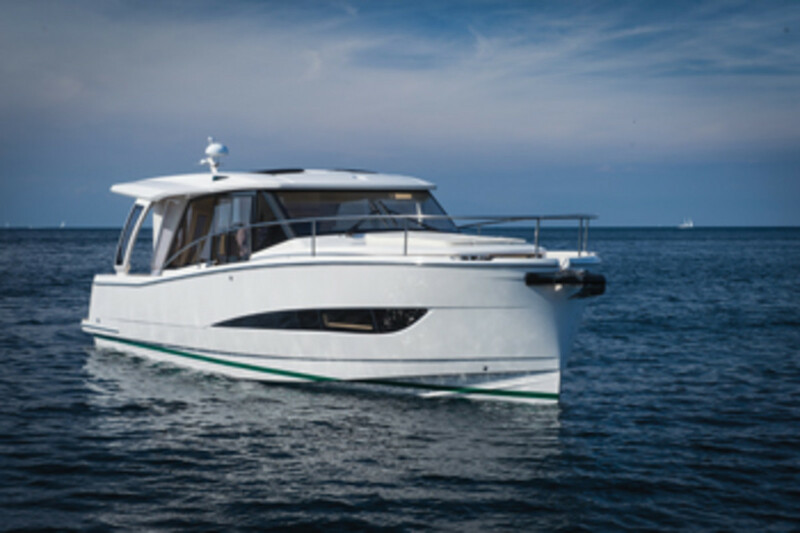 The Greenline 36 rides what the builder calls a “Superdisplacement” hull, which is designed to reduce drag. A single fin appended to the aft section adds stability. After we hit the open ocean, I took the wheel and ran the boat in all directions. The narrow forefoot and plumb bow sliced through the 1- to 2-foot seas. I spied a 70-foot motoryacht churning up an angry wake, so I ran for it, and the Greenline had no problem cutting through the 3-footers. The boat transitioned from displacement to planing speed with little bow rise, which allowed me to maintain my view of the horizon. She tracked straight and turned predictably. I was able to keep the boat on plane as low as 13 knots, which will allow you to make decent headway in rough seas. An electric flip-down transom gate creates a swim and boarding platform that’s flush with the cockpit sole. The hardtop extends over the cockpit, which has a large port-side bench and a seat in the starboard aft corner. The deckhouse has an aft, port-side galley. Open the full-size deckhouse door and aft port-side window to create a large, open space to the cockpit. With this aft window open, you can flip down a hinged section of the countertop to create a walk-up serving area in the cockpit. Large windows and light woodwork create a bright interior. Two standard electric overhead hatches bring in more natural light. The dinette, with a large table (44 by 24 inches), can seat four comfortably. 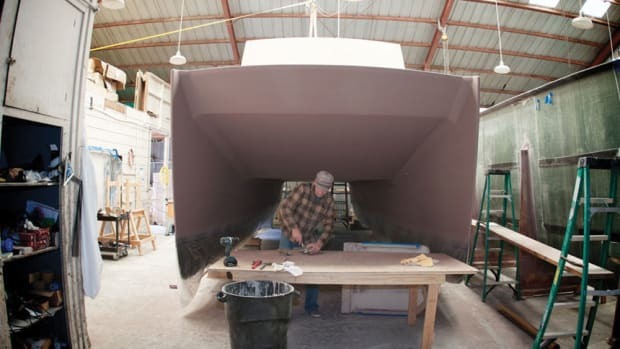 The companionway could use a handrail to guide you down the three steps leading below deck, where there’s a forward master stateroom, an amidships cabin and a stand-up head compartment. A scissor-action berth in the master gives you the option of a double or two singles. Eye-level windows and an overhead hatch draw in natural light. The amidships cabin to port has a double, crawl-in berth and stowage. The inboard bunk is cozy, with 16 inches of headroom. The starboard-side head, with a separate shower and a vanity with a sink, has a shared entrance and a second entrance from the master stateroom. Even without the electric motor, the Greenline 36, with its low-drag hull and modern diesel, is a fuel-efficient, environmentally friendlier coastal cruiser. The base price with the 370-hp Yanmar is $361,900; with the 220-hp Volvo Penta it’s $339,900. 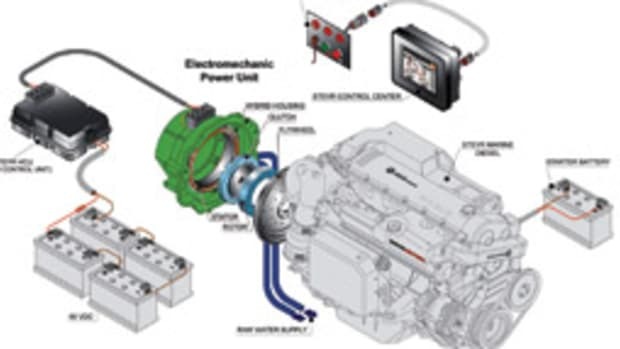 The hybrid model (Volvo Penta with 10-kW electric motor) is $374,800. Air temperature: 80 F; humidity: 65 percent; seas: 2 feet; load: half fuel, half water, four persons. Speeds measured with on-board Raymarine GPS/chart plotter. GPH taken from on-board Yanmar digital gauge. Range is 90 percent of advertised fuel capacity. Sound levels taken at the helm with closed pilothouse. 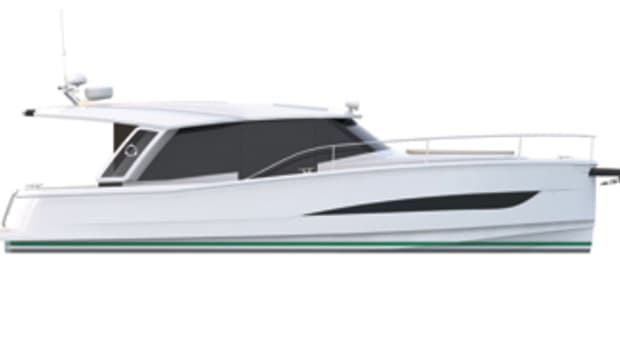 Bow and stern thrusters, solar pack (four panels), navigation and communications package, reverse-cycle air conditioning, full-size refrigerator/freezer, microwave oven, ceramic stove, water heater, transom shower, teak decking, inverter/charger, anchor with windlass. A Winning Combination By Chris Landry Casting off the bowlines, the Greenline 40 crept silently out of her slip and glided toward the Intracoastal Waterway. We had barely left the dock, and I was already experiencing the joys of green boating. Twin electric motors pushed the hybrid cruiser at 5 knots. 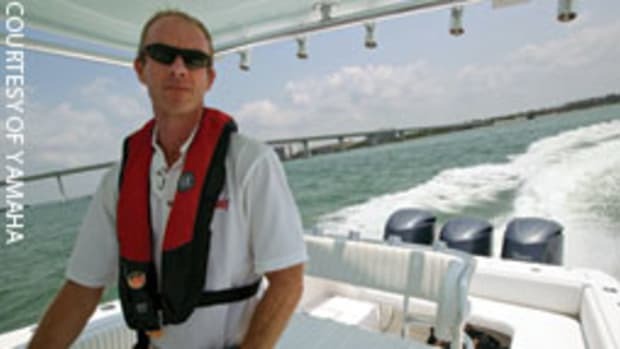 I took the wheel from Dennis Rhodes, Greenline’s U.S. sales manager, who had set up the demo ride for me at Harbour Towne Marina in Dania Beach, Florida. If you’re looking for an adrenaline rush, driving an electric boat probably isn’t your thing. But if you enjoy the sense of being enveloped in nature and close to the water, you’ll be thrilled by the Greenline’s quiet performance. The electric propulsion lets you enter and exit marinas and anchorages in silence, with zero emissions. How cool is that? It’s also very relaxing, and that’s a big part of why many of us go boating. I tried to measure the decibel level of the electric engines, but the meter only registered the gurgle of a small wake running from the transom. 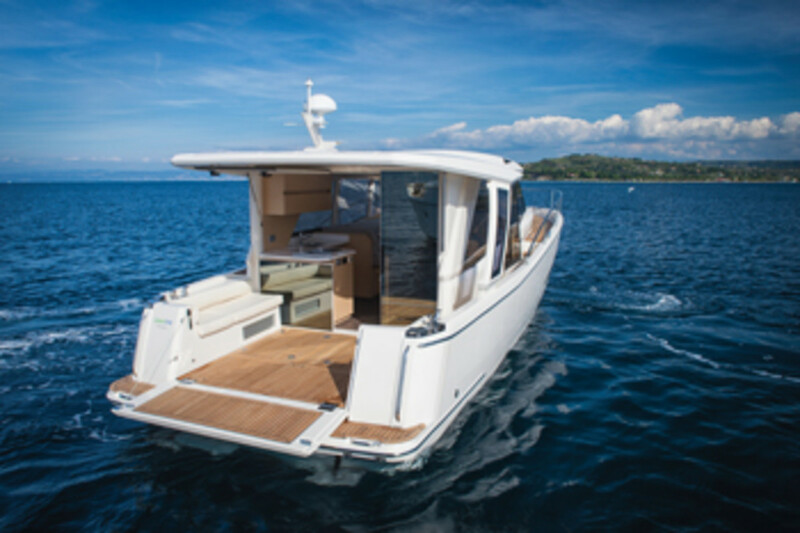 The hybrid propulsion system on the Greenline 40 consists of twin 220-hp Volvo Penta D3 diesels and twin 15-hp electric motors — conjoined by a hydraulic clutch — and a lithium battery bank. At the maximum speed of 6.5 knots, battery power will last about two hours for a range of about 13 nautical miles. She’s much more efficient at about 4 knots, where the batteries will last five hours for a range of about 20 nautical miles. Switching from electric to diesel takes a few seconds. Put the electric engines in neutral, turn the diesel/electric switch to diesel, wait three seconds for the clutch to engage, and push the start buttons. It’s that easy. 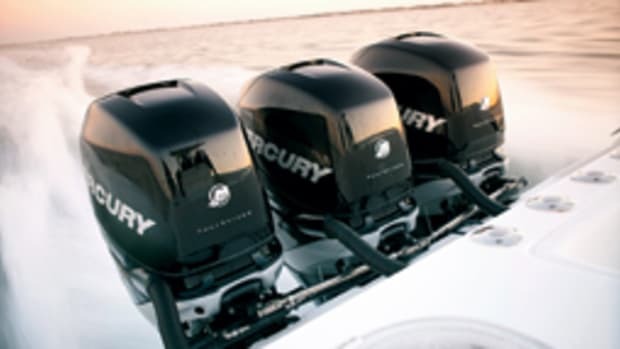 Most boaters will choose to run on diesel between destinations and use the electric motors to get in and out of harbors or explore scenic shorelines. It’s a winning combination.